Thunder bassist Chris Childs teamed up with German luthier Sandberg several years ago and was so impressed that a signature bass was an obvious step. A player with a keen understanding of tone and how it works in a given musical setting, Chris took the standard California model template, made some design changes here and there and set about creating his dream instrument. After months of fine tuning, we have the Enigma. Available in four and five-string formats, the resulting instrument looks lean, clean, sleek and well laid out. But does it deliver the killer punch? The curvaceous body styling feels comfortable to wear and nicely ‘familiar’, while the contouring and cutaways make the bass a near- perfect fit and pleasingly accessible. Looks-wise, simplicity is the key word; the alder body has been finished in a black high-gloss lacquer, while the racing stripes from the Sandberg Forty Eight model have been incorporated in cream. 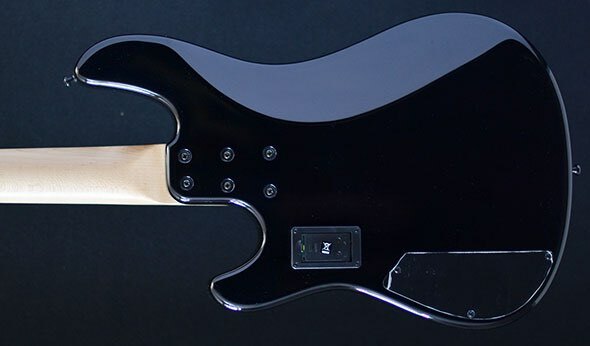 The results are very effective, giving the bass a classy look that extends up to the matching headstock. The hard rock maple neck comes with a satin finish and is made even more playable due to the shallow D-shaped profile; this benefits a five-string neck with 19mm string spacing and a 44mm nut width. The setup and overall standard of finishing is exemplary; at times, it can feel as though you’re playing a four-string instrument, it’s so accommodating. The six-bolt attachment is tight and solid with no visible gaps around the neck pocket. There are no sharp fret ends and although there are no front position markers on the richly coloured ebony fingerboard, white side dots are present. 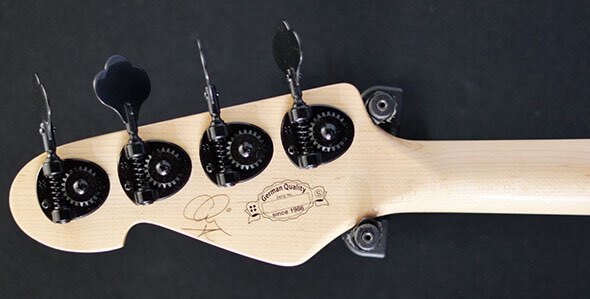 A signature model needs some unique touches, of course, and the Enigma features Chris’s signature on the rear of the headstock and a custom Enigma inlay marker incorporating his initials at the 12th fret. The lightweight Sandberg machine heads are very secure and feel substantial in operation, as do the four controls (volume, pickup pan, treble and bass) which are sensibly laid out for easy access. The top- loading Sandberg bridge is functional and does what it needs to do with a minimum of fuss. The bass balances very well when placed on a strap and instantly, the player is drawn to the natural tonal character of this bass. Holding the Enigma against you, the notes ring out fully and sustain impressively, indicating a fine natural tone with good resonance. The ebony board also plays a part in the instrument’s organic tone, and the promising acoustic sound is reinforced with a highly impressive sonic performance when we plug in. First impressions are very good; it becomes apparent, having played the bass for some time, that this is an instrument for all musical styles. Don’t assume that because Chris’s main bands are Thunder and Tyketto that this is an out-and-out rock bass; sure, it does the rock thing very well, but throwing different musical styles and techniques at the Enigma showed how flexible an instrument this really is. With a flat EQ, the response is solid and authoritative, with plenty of warmth and definition and a good string-to-string volume. Panning between the two pickups, the neck-based split-coil has a rounded tone with a characteristic low-mid punch, while panning to the bridge positioned humbucker tightens up the tone and adds some powerful humbucking tones. The EQ is well-voiced, featuring enough treble for improved clarity and definition, while the bass EQ adds additional strength to the low end when called upon. For the most part, boosting the EQ isn’t required very often. The low B string benefits from a little extra push in both departments but on the whole, the low end responded impressively. 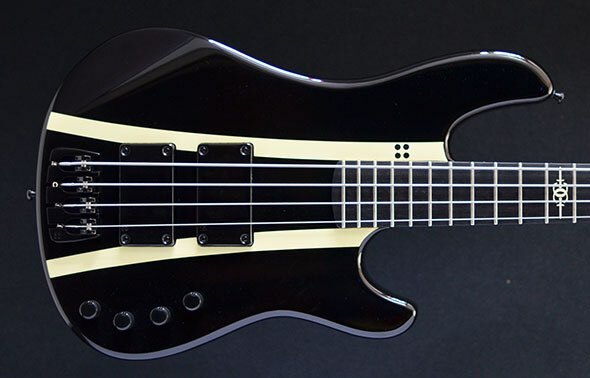 The bass offers a smooth, throaty snap when required to do so, again the hardness of the ebony fingerboard giving the notes impact and standing out a little more than they would with, say, a rosewood board. The fingerstyle tones bounce and bubble along nicely, while the slap tones cut through very well with a solid punchy character. Sleek, tasteful, minimalistic in places, and doing everything well with no fuss... much like its namesake! This is a fine instrument from the Sandberg stable and well worthy of its player. Chris obviously knew what he wanted here, and his opinions and requirements have been fulfilled. At £2150 for the five-string or £1999 for the four-string version, the Enigma is within reach of many budgets - so if you’re looking for a new adventure, the Enigma may just light up your playing. Highly recommended.